Best Software that I am using. 1 - Camtasia (for recording video on every movement on my monitor screen, and editing video). 2 - CamStudio (almost the same like camtasia but it is free but it is lousy than Camtasia). 3 - Freecorder + freecorder toolbar (downloading video from any kind of websites, convert video into other format without losing too much quality of video). 4 - Roboform (memorizing the username and password for my account on all the websites that I use). 5 - Clipomatic (memorizing all the words that I copied and pasted before). 6 - FontExpert (managing all the font types/families on my computer). 7 - Adobe Photoshop (editing graphic). 8 - Adobe Premier (editing video). 9 - Adobe Audition (editing audio). 10 - Adobe Dreamweaver (editing website / develope website). 11 - WAMPserver (develope php and mysql base website offline on localhost). 12 - Adobe Flash (editing animation / creating animation). 13 - Autodesk 3dMax (creating 3D animation and designing 3D graphic). 14 - Windows Plus Live (It allows me open and sign in many msn messengers at the same time). 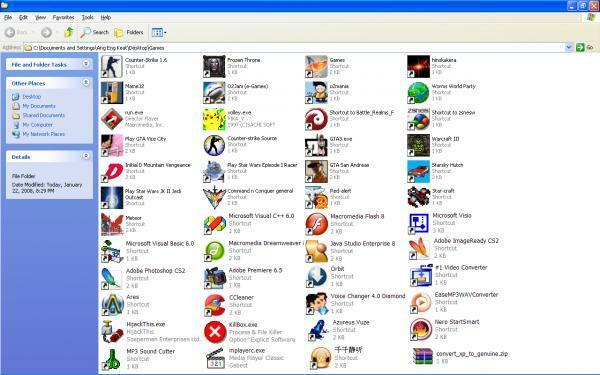 Other common software that I am using : Orbit, Nero, Msn messenger, Yahoo messenger, Google Talk, Mozilla Firefox, Internet Explorer, Opera, Maxthon, Safari, Google Chrome, PPStream, QVOD, PPFilm, Garena, TTplayer, QickTime Player (photoshop animation feature cannot work if without QickTime Player), Real Player, Media Player Classic, Ccleaner, Bitorrent, easyMule, Microsoft Office.